I would like to try to build a pedal based on the EQD Speaker cranker... which is based on the good old Electra Distorsion. It works fine, but i want to adjust some values, and try some other component for experimentation purposes. I enjoy the Speaker Cranker, but i want a more bass friendly pedal (so i upped the input & output caps values). I want to get rid of the Gain knob - so i have read that i can also get rid of the first 100µF capacitor. I have chosen a fixed value of 3.3K, which should bring me close to half-way of the 5K gain pot, roughly : am i correct ? I will socket the diodes, and also the transistor, o try with either a 2N3904 or a MPSA13. - Is my schematic correct, or is there any eror (it's among my first times using a veroboard ) ? For further discussions I drew the schematic according to your vero layout. Swap the LED in your layout, the flated aerea stands for the cathode. If the circuit should operates with 18V then R1 and R2 must be adapted. Wow, wonderful, thank you very much, Manfred ! At first sight, by looking at the schematic, does it seem correct ? Swap the LED in your layout, the flated area stands for the cathode. So, in this context, would there is an "universal" resistor value, which would make the circuit equally work at 9V and 18V (if not, i'd rather keep the 9V compatible value) ? The 2N3904 or the MPSA13 will be fine with 18V ? I don't understand what can cause such a volume drop, as my schematic is not far from the Speaker Cranker one (which i built, sounds great, and is a tad louder than unity gain). I tried first with a MPSA13, then with a 2N5088, both transistors sound the same. I then swapped the 3.3K "gain" resistor with a 6.8K : i didn't hear any difference either. With 3,3k you only have gain of roughly 2, you need to make it smaller not bigger. By removing the emitter capacitor you also reduced the gain. marshmellow wrote: With 3,3k you only have gain of roughly 2, you need to make it smaller not bigger. By removing the emitter capacitor you also reduced the gain. Ok, I get it. I will try with a 1K resistor, and add the capacitor back. How do i figure out the gain ratio, according to the resistor value ? the diode D3 got the wrong polarity, the type is 1N4148 and not 1N60. the circuit works fine with both supply voltages without any changes. the negative swing remains undistorted. In both cases the clipped positive voltage swing of the output are so high that the diode clipping starts earlier, the transitor clipping is negligible. The circuit works as a booster for a positive and negative input swings below 0.6 to 0.7 Vpeak for both supply voltages. With an input voltage of more than 0.6 to 0.7 Vpeak the clipping starts. I must take back my statement regarding the adaption of R1 and R2. I have already built a EQD Speaker Cranker version for a synth, using big value input/output caps, 2N3904 transistor and silicon diodes, and it sounds fine. I also built another one for an electric piano, using smaller values caps, germanium diodes and a MPSA13 Darlington. It sounds ok on an electric piano, but not so good for a synth (too much coloration, too much bass cut), and i had to put an EHX LPB after it because the output volume was way too low. Now, my idea is to build another version, with two stacked circuits, for an harmonically rich and boosted signal without loosing too much the original sound. After some further testings, i found some settings which suit me fine. Instead of adding a second layer of processing, i tweaked and tested some antiparallel diodes configurations, and i will use a diode switch. I really like the way this simple circuit can sound by changing the component values, it's easy to customize to taste. Here is a layout i tried to make. The concept is to have a true stereo effect (two circuits en parallel, one for the left channel, the other one for the right channel). So, i have put the left channel on the top part of the layout, and the right channel on the bottom part. 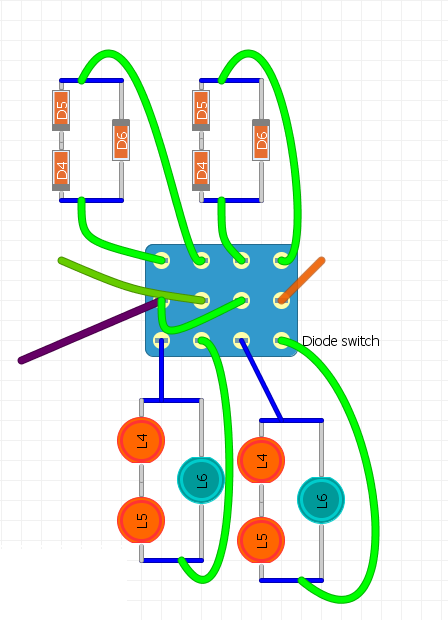 In the center of the layout, i have included a little decoupling circuit. I have already built the "core" part of the circuit (i mean one channel, for testing purposes), and it works fine. But i would need advices as i have never built a stereo effect : I guess there is still room for improvements on the layout, and maybe also some errors ? Maybe the grounding could be simplified ? Also, i don't know it the decoupling is accurate ? 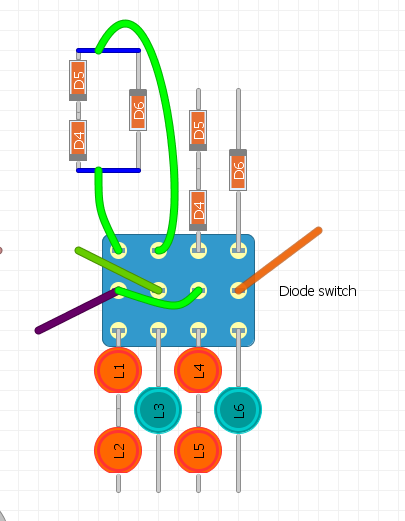 (note : i confess i have been lazy for the diodes layout : i have only shown the way there are wired to the 4PDT, and not their antiparallel wiring. Also, both the filter and gain pots are dual gang, and my picture only show one regular pot, so please don't take this into consideration). About the hicut filter : I wanted something "smooth" just to cut out a little bit of top end when needed, and i am quite happy with the result. But i used the only dual gang pot i had left, and chose the capacitor value accordingly. Would it give different results if i had chosen a smaller resistance value and a bigger capacitor (or an even smaller resistance value and an even bigger capacitor) ? - Does anyone have an opinion about the quality of the veroboard layout ? Does it make sense ? - About the hicut filter : is it any important to choose a smaller resistance value and a bigger capacitor (or an even smaller resistance value and an even bigger capacitor) ? At the moment I'm very busy with doing other things. I will have a look at but it takes time. 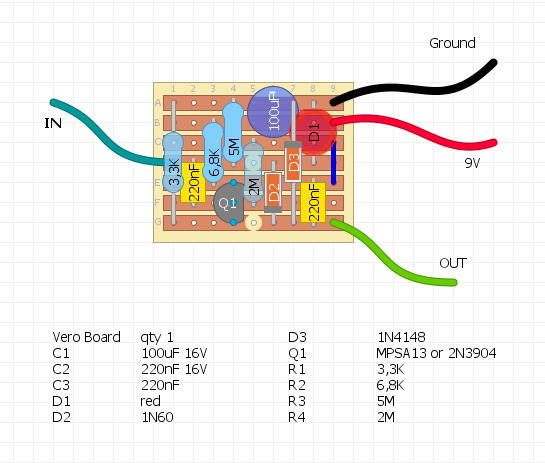 My concern is that, despite having built dozens of veroboards already, i always followed ready-made layouts, and therefore i think that with this one (which i created), there might be room for improvements. - it's meant to be atrue stereo (stereo in, stereo out) effect, using dual gang knobs. - So, i took the basic layout of theEQD speaker cranker(based on the Electra distorsion), tweaked it to custom values and with some diode clipping mods (which i tried on a "regular" mono board), and gathered both of them into a single board, along with a decoupling board. Hi snk, I drew the schematic according your latest vero layout. I guess the value of the gain pot is 5 Kiloohms. Please, complete the wiring of the diodes in your layout. The diodes use the "usual" parallel clipping wiring, like that (wiring done on the upper left serie of diodes, i will update the schematic accordingly). and provides for a low output impredance in respect to a common amplifier input impedance of 1 Megohm. Hi snk, the double switching of the caps and the diode circuties is not absolutely necessary.